Gaines, on Brains: Lunacy by the full moon-acy: Is it real? When I was in elementary school, my teacher told my class that the full moon makes people crazy. She said it was caused by the gravitational tug of the moon on the Earth—the same forces that cause high and low tides—the argument being that our bodies are more than 60% water. I was impressionable and fascinated by weird science—who isn't at that age?—and have long since stored that "fact"oid in my ever-developing hippocampus. The full moon last week (which, not to mention, was GINORMOUS—did anyone else notice?) reminded me of this theory and made me want to do a little research of my own. Does the full moon really do something to our brains? That being said, why would an illuminated moon have some sort of effect (on tides, craziness, etc. ), while a shadowed moon wouldn't? Here's where the "science" comes in. A 1985 meta-analysis review of 37 studies regarding moon phase and lunacy (including mental hospital admissions, hotline crisis calls, psychiatric disturbances, and criminal offenses) found no statistically significant relationships between the full moon and human behavior. 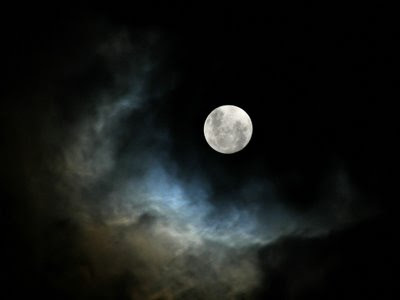 Sleep disturbances have been reported in response to a full moon. A 1999 hypothesis details how the additional outdoor lighting may contribute to sleeplessness. We should, perhaps, turn to the animal world to see how some non-self-conscious beings react to the full moon. A study on Azara's owl monkeys found them prowling the Argentinean forests more actively on full moon nights; the poor things will actually sleep in late the next morning, not unlike your average teenager. It also appears that prey are less active during the full moon, as the additional light makes them more visible to predators. Light, of course, can do crazy things to our circadian rhythm. So that has to be it, right? The full moon isn't causing, like, mini gravitational tides in our watery bodies. It's messing with our heads, somehow. Truth be told, we're likely just being paranoid and superstitious. Or perhaps those who claim lunacy are those who transform into werewolves a couple times a year. Photos courtesy Saananaveri and Wikipedia. I have plotted my husband's bad moods with the illuminationof the moon and there us a relationship so he's not off the hook for working extra hard to be nice during full moons just yet! Interesting post... Firstly, the moon illusion is something I have been fascinated with in recent times (which you alluded to in your second paragraph). The current theory is that it is all in the mind. In fact as the moon sets, it actually would appear smaller due to aberrations introduced by the atmosphere... Could be good for an interesting second post? Second, I am pretty sure tides are regulated on a 6-12 hour basis (i.e semi-diurnal or diurnal, for the tidal geeks out there :P), whereas the lunar phases of the moon occur over a month, thus any craziness due to tidal pulls of the moon would be expected to occur on a daily basis, not monthly. However, as you had alluded to in your post, the extra light (and specifically, the frequency of light given off by the moon) may have effects on the mood of people. Thanks for the good article! Interesting read. You're right—tides are regulated on a daily basis. However, during both the new moon and full moon, the Earth, sun, and moon all form a line ("syzygy"), and the gravitational pull from the moon and the sun are combined. The high tides are highest and low tides are lowest—they call these "spring tides" (though it has nothing to do with springtime). I have heard the same of increased hospital traffic during the full moon. A study I found about increased pet hospital visits hypothesized that the increased lighting with the full moon meant that owners were out later and longer with their pets, increasing their chances for getting hurt. It could certainly be something to examine further if researchers tracked exactly what kinds of injuries, presumably, these animals are suffering during the full moon. Long-term memory is stored in all sorts of structures, you're correct. I only mentioned the hippocampus because I had written a blog a few weeks ago about that structure. But perhaps soon I will write an entry about memory types and storage! Hi! I really love your topic choices. Although my writing style is a little different, I think we have similar interests in science, life and literature. Keep it up! I had a recent experience that made me think of the effects of the full moon from a different perspective. I was training for a marathon and frequently ran at nights. I appreciated the fuller moons because I wasn't tripping over curbs or pothole on dark streets or running into branches... actually planning my night runs to the moon cycle. Could a full moon be a simple and subtle invitation to go out and do something at night (with the limited options @ 3am, crazy can characterize many of the available activities, including middle age men who wrap themselves in reflective tape and run in a 10 mile circle...there were quite a few of us out there).